Listen to “30 Clip Extension,” the first single from Quazarz Vs. The Jealous Machines. 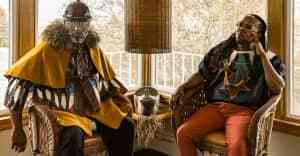 In April, Shabazz Palaces announced their return with "Shine A Light," the first single from the Seattle rap duo's upcoming album Quazarz: Born on a Gangster Star, out July 14. That same day, they'll release a second album called Quazarz Vs. The Jealous Machines, which continues Gangster Star's story. Listen to the first Jealous Machines single above; it's called "30 Clip Extension." Quazarz Vs. The Jealous Machines is out July 14 via Sub Pop. A limited edition comic drawn by Joshua Ray Stephens will drop August 18.